Up to now, drawing out reaction mechanisms using the curved arrow formalism has been fairly straightforward. Yes, sometimes there is some ambiguity with respect to which carbon of a C-C π bond is forming a new bond to an electrophile, but that can be readily solved by adding a few guidelines. There’s just one problem with the way this mechanism is drawn, above. It implies the existence of a free carbocation. And that doesn’t correspond to reality. We know that free carbocations aren’t involved in brominations* see here. So even though it might be more “convenient” to draw the mechanism this way, we must throw it out and try something else. So how might we adapt what we know about the mechanism of bromination to the curved arrow formalism? Here’s one attempt. Do you see the little dilemma that crops up when we have to draw an arrow pushing mechanism with a concerted addition to an alkene like this one? There’s a “fork” in the flow of electrons. The Br on the left is involved in three separate arrows. It would appear that the C-C π bond is acting both as a nucleophile (attacking Br) and an electrophile (accepting a pair of electrons from Br). Furthermore, the Br is acting both as electrophile (accepting a pair of electrons from the π bond) and nucleophile (donating a pair of electrons to the π bond). Only the role of the second Br is clear. It’s the leaving group! For concerted reactions of alkenes, we’re going to have to give up our cherished habit of being able to clearly trace the flow of electrons from nucleophile –> electrophile –> leaving group. It’s the price we pay for making our curved arrow mechanisms accurately portray reality. This goes for certain other “concerted” mechanisms as well – epoxidation and cycloropanation being two prominent examples. In the next post we will talk about a fourth (although quite minor, for us) reaction pathway for alkenes. How might we resolve the role of “nucleophiles” and “electrophiles” here? This is not easy, because it entails making further assumptions about the reaction mechanism that might not be based on solid evidence. With that hedge out of the way, here’s a proposal. : instead of thinking of C-C π and Br monolithically, break down each component into molecular orbitals. The C-C π orbital could act as a nucleophile while the C-C π* acts as an electrophile; the Br-Br σ* orbital could act as an electrophile while the Br lone pair could act as a nucleophile. 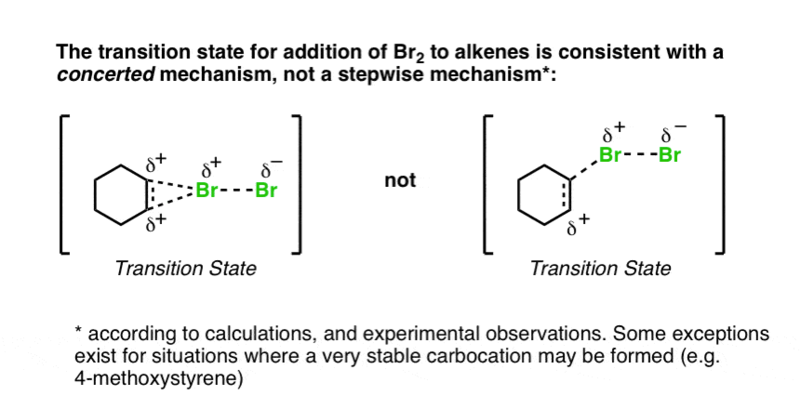 As it turns out, calculations indicate the bromination of alkenes with Br2 to be more complex than we might initially suppose. The initial step is coordination of Br2 to the alkene in a loosely bonded structure known as a “π complex”. The π complex then breaks down to give the bromonium ion. A proper treatment of the orbitals would therefore not strictly be of the alkene and Br2, but of the orbitals in the π complex itself. *Most brominations. Where a particularly stable carbocation can be formed – say, in the bromination of trans-4-methoxystilbene – carbocation intermediates are energetically accessible, and the stereospecificity of the reaction breaks down.